It was early December last year when I travelled to meet Spirit for the first time at her home, Kiwidinok Siberian Huskies, near Woodville. Two trips were made pre-birth to orientate myself with the location/environment and get a shot of a very pregnant Spirit. On both these trips I took the chance to enjoy another one of my passions, riding my motorbike. Weather can be fickle in December and although I headed off in fine weather on the first trip it bucketed down with rain as I travelled through Shannon until I reached the start of the Manawatu Gorge. Fortunately the sun was warm from there and I began to dry out before arriving on location. All part of the experience/fun!! I got the first call at 7.55pm on 19th December that Spirit was in the early stages of labour, meaning things could happen anywhere in the next 4 -24 hours. Another text half an hour later to tell me she is getting more restless, so I decide to grab my camera gear, sleeping bag, energy bars and head on up to Woodville, by car this time. I thought it was better to be there early so Spirit is relaxed with me on site and not miss any of the birthing action. On arrival I quietly made my way out back to the room where Spirit was set up with whelping box. Nardine had a bed set up by the whelping box and my camp stretcher awaited me. There was plenty of pacing and panting from Spirit through the night but no puppy arrivals. It was going to be a long labour. The following day was spent keeping a close eye on Spirit and napping at any opportunity to catch up on lost sleep from the night before. Spirit was constantly moving all that day, pacing from her human built whelping box to wandering the paddock and digging her own natural den under the stump of a tree!! Rather impressive effort in her pregnant condition. In her mind natural was way better than a human purpose built, comfy, warm box inside. It was early evening when Spirit was showing strong signs of things moving along, so it was time for her to be kept inside with whelping box at hand. After a 20 minute session of pacing and some loud howling Spirit became more quiet and began to push. The head of the first pup emerged just after 6.30pm, a very bonny 555g boy. It was a patient wait for the next pup to arrive 3 hours later weighing in at 550g. The third arrival, a little girl, weighing 430g hurrying out soon after. 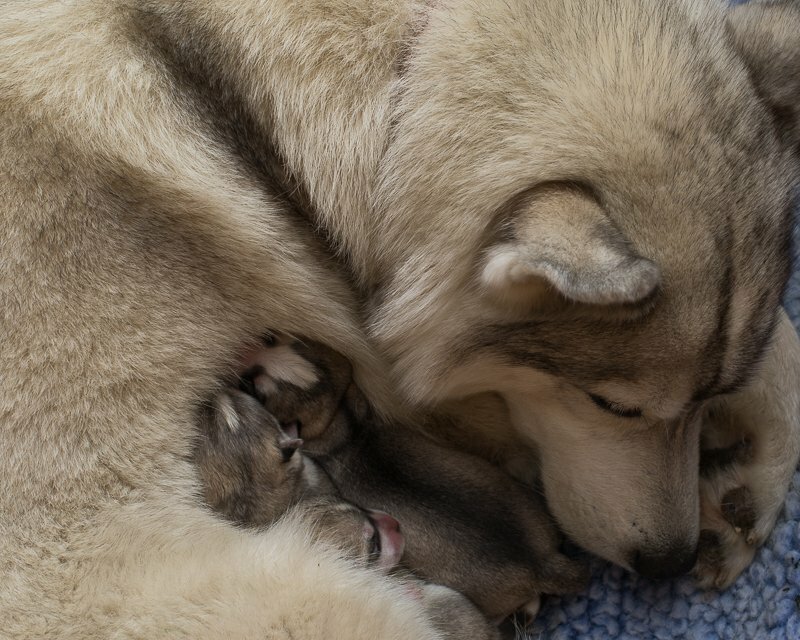 Not having ever witnessed the birth of pups before it was incredibly special to be there and witness the tender, caring and protective nature of Spirit from the moment the first pup arrived. As each pup arrived Spirit licked it clean, which also stimulated their breathing. Nardine weighed each pup and Spirit was quick to be at her side and right where the pup was all the time, desperate to make sure nothing happened to it. On guard during all of the time Spirit was in labour and having the pups were her mum Dusty and dad Chase. They stayed glued outside the door of the room and remained there all night. 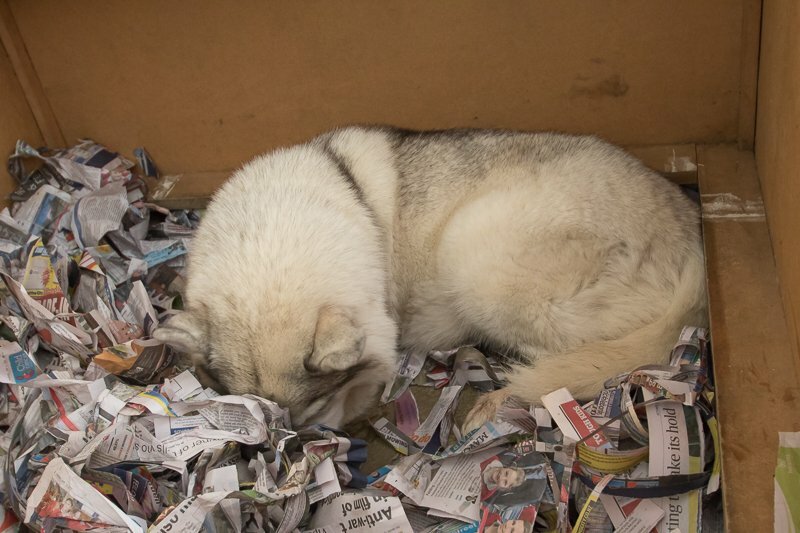 The whelping box was refreshed with new bedding and both Mum & pups were all snuggled up together by 11.45pm. Time for us to crashed for the night, waking again at 6am the next morning to see how the little family were doing. In the morning Spirit and pups were taken for a routine check at the vets, which was my cue to pack up and head back home, feeling very privileged to have witnessed such incredible, unique, moving and memorable moments. Next visit to see the little ones is 9 days later and then again at 16 days old when their eyes have opened. On opening the eye colour is blue in both pups but by 37 weeks when I next visited, one pup had distinct brown eyes and the other bright blue. During these first few weeks their ears also start to open and they hear more and more sounds. Capturing them experiencing the world for the first time with different senses is quite the challenge. 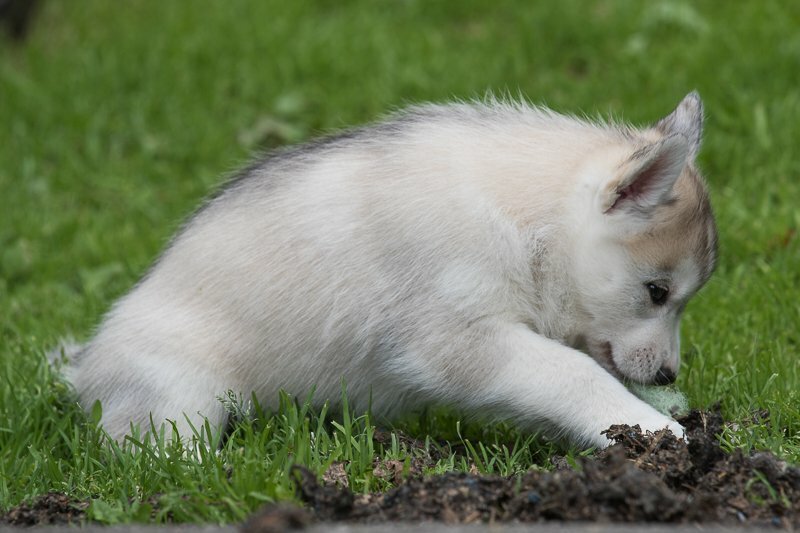 Things like their first attempt at howling, digging, and play fighting tug of war. The pups were registered with the NZ Kennel Club and names announced on the Kiwidinok Siberian Huskies Facebook page early April. A car race theme was used to link them to their Dad Mac (CH Huricane’s Vroom-Vroom Vroom (USA) to AUST). Enzo (brown eyed boy) is Kiwidinok Birth of a Legend, named after the legendary Enzo Ferrari and Chevy (blue eyed boy) is Kiwidinok Need for Speed. By the next time I visited in Woodville, Chevy had left and was now living with his new family about 40 minutes away. Both boys had grown heaps and now were handsome young dogs. Below, Enzo at 4 months. And Chevy at 5 months. Notice how Chevy’s eye colour has changed to a lighter blue as he matures. A really beautiful post and such an amazing experience. We love Spirit to bits for giving us baby Chase – Enzo’s half brother. What a great post and photography.